Regardless of the precise picture that comes to mind, water is almost universally connected with life. We often speak of the “water of life” or the life-giving quality of water. That’s the funny thing about water. It is life-giving. That’s what God meant it to be. But, did you know that water can also be a killer? We’re not talking about the Titanic or natural disasters that cause flooding. We’re talking about drinking water. That’s right. Drinking water. When we think of water, we think of clean water. Would it astound you to learn that nearly a billion people don’t have access to clean drinking water? Would you believe that every minute, somewhere in the world, a baby dies from infections caused by unclean water? Or that a child under the age of five dies every two minutes because of diarrhea and other diseases caused by dirty water and poor sanitation? That is 800 children per day. Do the math. There are 525,600 minutes in a year. That equates to more than 780,000 children who die each year either directly or indirectly because of dirty water. Something is wrong. Something needs to be done. March is Water Action Month, a month set aside by leading clean water advocates and NGOs to draw attention to and support for campaigns being waged to attempt to “leave no one behind” when it comes to having ready access to clean water. March 22nd is World Water Day which is sponsored by UN-Water, the global organization’s inter-agency collaborative mechanism for all freshwater related issues. On World Water Day 2018, the UN will initiate the International Decade for Action: Water for Sustainable Development. Clean water initiatives are a lot like clean water itself. They sound good and feel good from the perspective of awareness, but the disturbing reality is that the action necessary to alleviate the problem is painfully slow and almost incomprehensively expensive. Estimates place the investment needed to reach the goal of reaching everyone everywhere with clean water at $28.4 billion dollars per year. That is nearly $370 billion to be spent between now and 2030. In Asia alone, there is no available data for 50% of the national populations and insufficient data for another 15%. Progress has been deemed inadequate in another nearly 15%. In addition, two-thirds of the countries monitored by WHO and UNICEF don’t have baselines or baseline estimates upon which to establish a foundation for measurement. 206 million people in South Asia lacked access to “at least basic water,” a euphemism for access to improved drinking water sources within 30 minutes or less to a point of collection. 89% of those people, about 165 million, live in India and Pakistan. India Spend estimates that 63.4 million Indians, the combined populations of Australia, Sweden, Sri Lanka, and Bulgari, do not have access to clean drinking water. These few facts alone in South Asia and India constitute a crisis of global significance. Perhaps Henry Kissinger summed it up best when he said, “There cannot be a crisis next week. My schedule is already full.” That was the former Secretary of State’s wry sense of humor indicating how we tend to look at crisis situations. The human tendency seems to be to ignore crises when they happen because we are too busy. That is, until we are the ones caught in the crisis. That’s where God’s call to us demands a change in our approach. Jesus told the parable of the Good Samaritan (see Luke 10:25-37) to make a point. The man who had been robbed and beaten was in a crisis situation from which he could not extricate himself. Several passers-by continued on their way. Only the Samaritan was obedient to what Jesus called the Second Great Commandment, i.e., love thy neighbor as thyself. The motivation for loving those who are in need flows directly from loving the Lord our God with all our hearts and all our minds and all our strength. God’s love motivates us to help others. 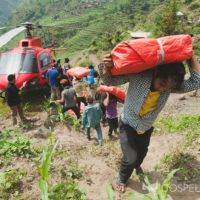 Our love for God compels us to love others and help them in their time of need. That is why, in 2016 alone, GFA in association with our national pastors funded and constructed over 6,800 Jesus Wells in South Asian villages and communities where they either had no access to clean water or, because of their low social status, were forbidden to use existing wells or even touch the pump handles. A Jesus Well provides clean water to as many as 300 people per day and can last 20 years. Jesus Wells are available to everyone, regardless of social status. Each well has a Scripture verse about living water attached to it so that all who are drinking from the well know that there is a well that never runs dry and His name is Jesus. GFA tries to locate Jesus Wells near churches whenever possible so that villagers see that local pastors are not there to increase the size of their following but so they can understand the depth of their concern for their overall welfare. The gift of a Jesus Well not only makes clean water accessible, its use can save entire villages from waterborne illnesses. While a Jesus Well costs only $1,400, it takes more than $9.5 million to build 6,800 of them in a single year. That is possible only because of the generosity of GFA supporters entrusting us with the funds to enable these projects in places where access to clean water would otherwise have been impossible. GFA also provides clean water – 98% pure – by gifting Bio-Sand Water Filters to families and small communities. GFA gave nearly 15,000 bio-sand water filter units to individuals and families in 2016 alone. The filtering units strip the water of its impurities without the use of chemicals. Bio-Sand units are about the size of an average office water cooler. Dirty water is poured into the top of the device, then gravity draws it through a diffuser plate and several layers of sand and gravel. Water delivered at the spout can remove more than 90% of bacteria and 100% of parasites, dramatically increasing the safety of the water and, therefore, the health and well-being of those who are blessed to have a unit. The clean water crisis is not one that can be solved by one organization alone, but GFA has been and, by God’s grace will continue to be a leading provider of the gift of clean water to “the least of these” throughout South Asia. We don’t do it because it is easy. We do it to demonstrate His great love. It may be that, because of the gift of a Jesus Well of a bio-sand water filter, some will be drawn to want to learn more about Jesus, just like the woman at the well in John chapter 4. Click here if you would like to learn more about how you and your friends can give a Jesus Well. Read this to learn more about how you can provide a bio-sand water filter. Thank you for partnering with GFA to provide clean water to as many as we can possibly reach. Water Aid, Clean water, decent toilets and good hygiene are vital for living a dignified, healthy life. This entry was posted in Essays and tagged bio-sand water filters, clean water crisis, global water crisis, Jesus Wells, South Asia water crisis, world water day. Bookmark the permalink.